Our application to Heritage Lottery Fund for Our Heritage funding was turned down in January because of our shortage of matched funding, this despite partial underwriting by Radnor House School. The project was in all other respects well-received and we are encouraged to persevere. We now await the announcement of the new HLF funding strategy, when Trustees will decide on our next steps. In the last few months we have been awarded generous grants by HB Allen Charitable Trust, Swire Charitable Trust, Radcliffe Trust, London Community Foundation, Country Houses Foundation and John and Ruth Howard Charitable Trust. We are enormously grateful to them all and to our private donors for their confidence and support. Please join them in giving to this project! Alexander Pope’s Grotto is the last remaining part of his villa, which he built in 1720 on the banks of the Thames at Twickenham. Demolished in 1808, the villa was replaced and the property became the subject of much redevelopment over the following 200 years. In 1996 St James’s Independent School for Boys acquired the estate, remaining for 14 years. In 2005 the school created a Charitable Trust to “preserve [the Grotto] for the benefit of the people of Twickenham and of the nation ….” Work to this end had reached an advanced stage of development before their departure in 2010. A grant from English Heritage financed the preparation of detailed options for conservation and restoration. These options defined a considerable body of work which, given funds, could form the basis of selective restoration, over a period of time. Ownership of the building has passed to Radnor House School, a wholly new enterprise. Although presently committed to its own development, the school supports the project for restoration . A working group of interested people been formed for this purpose, its prime objectives to seek funding and oversee the work, which will probably be carried out in modest stages. New trustees, representing the school and other local organisations, will be appointed in order to keep the charity in being. 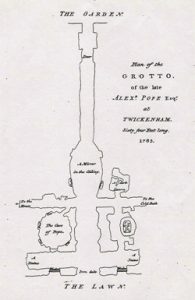 The Grotto (seen right in a plan drawn by Samuel Lewis in 1785) fits Historic England’s current criteria for a grant, but matching funding will be required. Restoration will probably start with a careful clean-up to reveal the extent of the remaining geological examples. 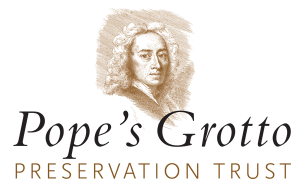 Alexander Pope’s Grotto is a remaining icon of one of Twickenham’s most celebrated residents. It enjoys a magnetic attraction because of his enduring reputation as a poet. This relic of his life in Twickenham also acts as a reminder of English culture, literature and garden design in the 18th century. In its time, the Grotto was an object both of admiration and envy, inspiring imitation throughout England. Even today, in its shabby condition, it draws students and enthusiasts from all over the world.